Anyone who wants their coffee to be as fresh and as tasty as possible will want to invest in a coffee grinder. That’s because essential oils are locked in the coffee beans, and this keeps them from being lost to the environment. Once coffee beans have been ground, these essential oils begin to dissipate quickly. Which is why it’s important to grind coffee beans right before brewing coffee. While most coffee aficionados agree that grinding your own coffee is the best way to preserve flavor, it can be confusing to choose a coffee bean grinder among the dozens of models available. Which is why we’ve taken it upon ourselves to select ten models that we feel are the best grinders currently available. These are models that get the job done so the coffee drinker can get on with the business of brewing the best cup of coffee possible. With a modern design that is suitable for just about any kitchen, this grinder is a nice mix of beauty and function. It has 60-different grind settings which allow the user to select the exact grind they need for their particular coffee drink. It has an 18-ounce coffee bean capacity and can grind directly into a gold tone filter, a paper filter, a portafilter or even a grind holder. This unit has an electronic timer which allows the user to adjust grind time in 0.2-second increments and has a display which shows the user the grind time, shot size and grind size of their current grind. Sometimes all you need to brew a great cup of coffee is a grinder which will just do a basic grind and is simple to operate. And that’s exactly what this Hamilton Beach grinder does so well. While it doesn’t have all of the bells and whistles that its competitors do, it is capable of grinding beans well enough for automatic drip machines. If the user wants a coarse grind, they only need to run it for a second or two. If they need a finer grind, then they can grind the beans longer. This grinder has stainless steel blades, a removable grinding chamber and a simple to use on/off button. This grinder has a beautiful modern design that allows it to fit in with the decor of just about any kitchen. It also has a compact size that doesn’t eat up counter space like other appliances have a tendency of doing. And although it’s small, it can still hold up to 2.1-ounces of coffee beans. This product is made with stainless steel blades and a steel housing, which makes it quite durable and allows it to grind beans efficiently. It also has a detachable container that makes it easy-to-clean and a power cord that winds up under the base for easy storage. This burr grinder has a nice looker design and has a heavy-duty zinc die-cast housing that makes it quite durable. It also has commercial-grade conical burrs that allow users to get the most out of their coffee beans. It also has 16-grind settings which allow users to choose the exact grind they need. Which means that this grinder can grind beans for everything from French press coffees all the way to Turkish coffees. 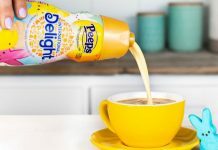 It also has a coffee bean container that can hold up to 8.5-ounces of beans and a grounds container that can hold up to 4-ounces of coffee grounds. This electric grinder is designed for people who don’t want to mess with a lot of different settings and just need a machine that allows them to grind their own coffee beans. 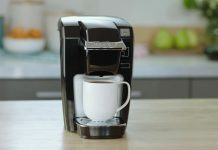 It has a 2.5-ounce capacity, which means that it can grind enough beans for up to 7-cups of coffee. It also has a one-touch operation that makes it easy-to-use and very efficient. This machine’s most important feature is its stainless-steel blades which allow it to grind up beans for just about everything from French press coffees all the way to espresso. This product is also durable enough to be used for grinding up nuts and spices as well. Manufactured using a very simple design, this product can not only grind coffee beans but can also be used to grind a variety of different things including various grains, spices, herbs and even nuts. It has durable stainless steel blades and a powerful 200-watt motor that allows for quick and easy grinding every single time it’s used. 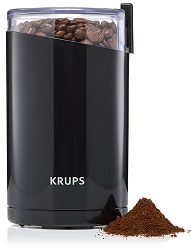 This grinder can hold up to 3-ounces of coffee beans, which is enough coffee grounds to brew up to 12-cups of coffee. It also has a sleek and compact design that doesn’t take up a lot of kitchen space and can easily be stored in a cabinet. This coffee grinder is quiet, compact and can be taken anywhere the user needs to grind coffee beans. It’s a manual grinder, so electricity is never needed, and it’s super quiet so it can be used while loved ones are sleeping without worrying about disturbing them. It screws onto a glass ground collection jar and can be used to grind the perfect ground fineness. It’s made with ceramic conical burrs which give a consistent grind and has a stainless steel grinding bowl that’s extremely durable. This product can easily be adjusted to provide a grind from a French press all the way to an espresso grind. It doesn’t matter if the user needs a super fine grind for espressos or a coarser grind for French press coffees, this coffee bean mill is up to the job. It has different settings which give the user the control they need to grind their coffee beans in exactly the way they need to grind them. It has a beautiful brushed stainless steel design and doesn’t require batteries or electricity of any kind. 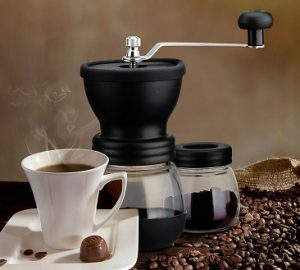 It has 18-different click settings and uses ceramic conical burrs for an even and consistent grind each and every time. And it can not only be used at home but can also be taken apart to be packed into a suitcase or handbag. Style, function, and power all intersect in this high-quality electric grinder. It uses stainless-steel blades and a steel grinding cup to grind beans evenly and consistently and has a 250-watt motor that allows it to grind things other than coffee beans including such things as nuts, herbs, and spices, too. It has a clear lid that allows the user to see exactly what they’re grinding and also has a safety lock that prevents the lid from being opened when the unit is in use. This product is equipped with a large activation button that makes it convenient to use and has built-in cord storage that makes it easy-to-store. This coffee and spice mill is easy to use yet offers the power people need to meet their grinding needs. It can be used for coffee beans, herbs, spices and nuts and can grind all of these things without making a huge mess. Users can make a coarse grind that’s suitable for French press coffees by holding down its button for approximately 8-seconds. If a finer grind is needed, the user can hold the button down for 15-second for Aeropress coffees or 25-seconds for espressos. It delivers true one-touch grinding that allows the coffee user to grind their beans without having to devote a whole lot of time to it. Now that you’ve decided to buy a coffee grinder, what do you do with it and what features do you need? Those are questions frequently asked by both amateur coffee enthusiasts as well as long-time coffee drinkers. While the obvious answer would be to say that you use the grinder to grind the beans, that would be too simplistic. After all, there’s more to grinding your own beans that just the act of grinding them. There’s a lot of things to consider such as whether blades or burrs are better and whether or not you need a unit that will dose your beans. Let’s touch on some of these key points. If you read most coffee connoisseur websites, then you probably believe that you absolutely need a burr grinder. That nothing else will suffice. However, that’s not strictly true. Sure, burr grinders are usually some of the best grinders available, but that’s only because they produce a grind that’s more uniform than blade coffee grinders. And some coffee drinks such as espresso require a uniform grind. However, the average coffee drinker can probably use a blade grinder and be quite happy with it. That’s not saying that any blade grinder will do, however. I wouldn’t recommend running out to a dollar store and buying the cheapest model available. Why is that? That’s because you’ll end up with a grinder that doesn’t grind the beans properly and this will result in an uneven extraction of the essential oils in the coffee beans. If you decide that a blade grinder will serve your needs, then we’ve selected some very good models up above. If you’ve decided that you do indeed need a burr coffee grinder, then you basically have two different sub-categories to choose from. There are models that use conical burrs and models that use flat burrs. Which one is right for you? Well, that’s not easy to answer because it seems like everyone has a different opinion on the subject. Some people prefer flat burrs grinders and others may prefer conical burr grinders. Speaking from my own experience, I tend to prefer conical burr grinders because I feel like they are easier to adjust than flat burr ones. What’s actually more important than whether a coffee grinder has conical or flat burrs is whether it has ceramic or steel ones. That’s because there are legitimate pros and cons to each of these materials. Let’s take a look at each type of burr and find out where they shine and where they fall short. Ceramic Burrs – These burrs are often found in espresso grinders because they produce a nice even grind. And they usually last longer than steel burrs. However, they also tend to be more expensive, and if something other than a coffee bean is accidentally used in them, then they can potentially shatter. On the other hand, if they’re carefully used, then they can last a really long time. Steel Burrs – Steel burrs tend to be cheaper, and don’t have the tendency to break the way that ceramic burrs do. However, they do wear out quicker than ceramic ones and have to be replaced on a regular basis. Which isn’t too difficult but is still something that the consumer needs to keep in mind. Whether or not you need a coffee grinder which can dose or one which doesn’t dose really depends upon your personal preferences. Dosers allow the user to grind exactly the amount of coffee grounds they need but can be difficult to clean. Doserless models are more difficult to use but are easier to clean. Do You Need A Coffee Bean Holder? 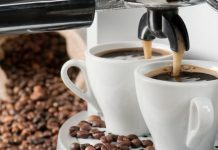 There is another important thing to consider, and that’s whether you need a grinder that stores beans or whether you plan on storing the beans separately from the grinder. This all depends on your personal preference and how many coffee beans you grind. If you grind a lot of beans, then buying a grinder with a bean holder may be necessary. Manual coffee grinders have been exploding in popularity recently, and that’s because they do have a number of benefits. These grinders tend to be cheaper than electric models, and most of them do a great job at grinding coffee beans. However, they also require a lot of elbow grease to use and will never be able to grind as finely as an electric model, which can be a concern for Turkish coffee fans. Modern coffee bean grinders have a number of features which make them quite useful. This includes preset coffee grind size according to the type of coffee, the number of seconds in the grind, dosage, time and just about anything else you can imagine. Whether or not you need a machine with all of the features really depends on you. Some people tend to shy away from preset grind settings because they like to personalize their grinding and that can be difficult to do with an automatic grinder. How Long Do You Grind? Now that we’ve covered some of the features found in most coffee grinders, it’s now time to answer a common question: How long do you grind your beans? While this question is often settled by the use of automatic machines which have preset grinds, with manual models you’re going to have to pay attention to how you grind the beans. Below is a guide to how long you should grind your beans according to what type of coffee you’re brewing. French Press Coffee: Grind for 7 to 9-seconds. Percolator Coffee: Grind for 8 to 10-seconds. Automatic Coffee: If using a paper filter, grind for 12 to 15-seconds. If using a metal filter, grind for 9 to 12-seconds. Espresso: Grind for 16 to 20-seconds. Turkish: Grind for 20 to 22-seconds. As you can see, buying a coffee grinder doesn’t have to be a difficult process. Nor does using one. All you have to do is consider your particular needs, the type of coffee you enjoy and then what features you need. Once all of these factors have been taken into consideration, it’s quite easy to find the model that’s perfect for you.